In February 2004 the state of the Chapel was brought to the attention of the group, who at that time were just starting on the Skatepark Project. The group decided that they would seek funding to undertake whatever work was necessary to ensure its future. 1. Supply and erect scaffolding to gain access to roof slopes and external walls of Cemetery Building. All scaffolding to be in compliance with Health and Safety Regulations. 2. Carefully strip off existing natural slates and ridge crease from main roof and single storey lean-to roof. Put sound slates to one side for refixing later. 3. Remove existing C/1 H/R R/W gutters and downpipes, put sound goods to one side for refixing later. 4. Replace part barge boards and soffit board to one gable end. Barge boards to be formed from Iroko hardwood. 5. Included in estimated price P/C sum of £500.00 for any works that may be required to roof timbers. 6. Supply and fix over rafters one layer of Tyvac felt/treated 25 x 50 softwood battens. Refix slates to battens previously removed, inclusive of ridge crease. 7. Included in estimated price, P/C sum of £2000.00 for the purchase of additional slates, to make up for any shortfall, due to existing slates being crushed or porous. 8. Refix sound rainwater gutters/downpipes removed previously, make up for any shortfall with new C/1 H/R gutters, downpipes and fittings. Decorate rainwater goods complete with a full oil based paint finish. 9. Decorate all exposed rafter ends, barge boards and soffits to a full oil based paint finish. 10. To external walls, hack out all mortar joints to stonework. Repoint walls in lime mortar. 11. Included in estimated price P/C sum of £800.00 for the refurbishment of existing doors, door frames and windows. 12. Prepare all external faces of windows and doors and apply over spot primer, undercoat and glass paint. 13. To flanking wall, cut/stitch vertical crack. 14. Included in estimated price P/C sum of £700.00 for the supply and fixing of external galvanised metal window grilles. Grilles are to be bolted to external walls. 15. Supply all plant, scaffolding crawling boards, tools, security fencing, to enable work to be carried out. Supply temporary W/C and canteen in compliance with Health and Safety Regulations. Welfare for workmen on site. Stage payments will be required on a monthly valuation as works progress. Trusting the above will meet your approval. During Autumn 2005 Derris Watson worked on the business plan required to make an application to the Heritage Lottery Fund and then wrote the bid. In February 2006 we received the news that our bid had been approved and that a grant of £35,300 which represented81% of the total cost was available. The balance of the costs to be provided by the group as “in kind” contributions of labour and loan of equipment. Meetings were held, with interested new membersattending, to plan the time table for the work we had to do and with the first funding received we started. Further quotations for the building work were obtained but F D Hall were considerably lower than the others so an order was issued for the building work to bedone. The work was completed during the summer of 2006 and the account paid. 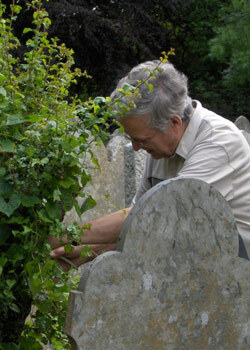 James Emuss cleared the Laurels from around the Chapel in the Spring of 2006 and volunteers started to clear away small trees and brambles. Ivy which was obscuring the inscriptions on headstones was removed and general tidying continued all the way through theproject. Bob Stockhausen started on the Breeding Bird Survey in the Spring of 2006 and continuedthe work through that year and did a comparison in 2007.You can find his results in the Flora and Fauna section. He iscontinuing to monitor thebird population to ensure its health.He has also worked with the school next door to the Cemetery involving the children in the happenings and giving a talk to the classes involved. Bird boxes were installed to provide extra nesting sites and the school adopted these following the progress of their birds with great interest. Although the building work was completed in 2006 in was felt that giving thebuilding a chance to dry out would be best and therefore the interior was painted with the correct lime paint and the ceiling treated with preservative over the weekend of 21st April 2007. Shortly thereafter a working party, led by Georgie Kelly washed the pulpit benches and floor. 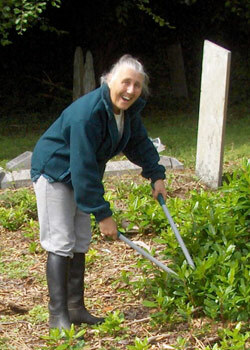 Daphne Cook and Bob Stockhausen completed a survey of the plants in the Cemetery which can be found in the appropriate section. Martin Russell (Webcube Media)has built our website for which we are very grateful, Iain Rowe has collated information all through the project andproduced the DVDs with the information which people can purchase and Stuart and Millie Hookway have produced our exhibition material. Les Piper has fitted plaques, installed the bench and the new gate at the entrance by the garages as well as joining in the general work with his wife Enyd. We are grateful to Sean Kelly for persuading his employers to loan the scaffolding which made the decorating quick and safe, and for his hard work together with all the other volunteers who provided aching muscles and sweaty brows to complete the manual work. Finally for devotion to duty in managing the project, arranging working parties and much manual effort our thanks go to the Chairman of the ProjectsGroup Bob Emuss. Bob Emuss - Group Chairman. 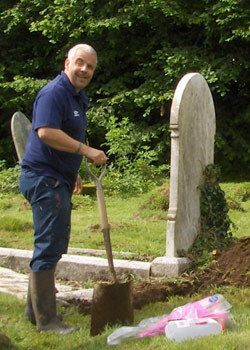 Has acted as Project Manager and been involved in all aspects of the work in the graveyard and Chapel. Wrote the Business Plan and Heritage Lottery Fund bid, transcribed the Trustee Minutes (1867-2007) onto disc, provided secretarial/IT services to project and participated in the work in the graveyard and Chapel. Carried out the Bird Surveys in the graveyard and liaised with St Cleer School, giving the children a talk on the birds. He also worked on the graveyard and Chapel. Barbara and David Willcocks Provided the burial records on disc, some photographs and worked in the graveyard and Chapel. Daphne and her husband Les joined all the working parties at the cemetery and Chapel. Daphne also provided refreshments for these. Collated information and produced the Chapls multimedia presentation and CD/DVDs. 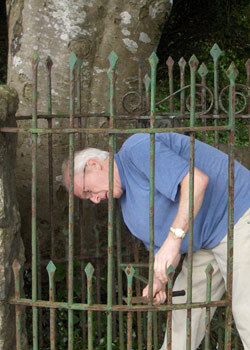 Worked on the clearance of the cemetery and interior of the Chapel as well as providing refreshments for the group.